Disclaimer: All statements in this publication concerning requirements, amounts, conditions or other matters are for informational purposes only and are subject to change without notice. A primary objective of the scholarships offered by Canadian University Dubai is to promote the recruitment and retention of high academic achievers. At the same, we understand the importance of difference and diversity and we do not want financial limitations or special needs to get in the way of a great education. Please note that the number of scholarships awarded is limited and students must meet the minimum selection criteria for the relevant category in order for their application to be considered by the scholarship committee. The amount to be awarded depends on the specific criteria outlined for each scholarship. Students must maintain the cumulative grade point average (CGPA) necessary in order to continue receiving scholarship funding. The specific CGPA requirements vary according to the type of scholarship applied for. These details are outlined in the specific scholarship descriptions. Scholarships are not valid for summer semesters. Students can apply for more than one scholarship, provided they meet the eligibility requirements. In case a student qualifies for more than one reduction, scholarship or discount, the student will be given the chance to choose the scholarship with the highest value. All remaining fees (tuition and housing) must be paid promptly in order to receive and maintain the scholarship. Scholarship recipients or those who qualify for a reduction in the cost of tuition may not appeal the decision of the University, or the percentage or amount of reduction assigned. The decision to grant or deny a reduction in cost is final. To be considered eligible for the Academic Excellence Scholarship, students need to be enrolled in a minimum of 12 credit hours. Scholarships awarded for the fall semester are valid for one year, provided that the CGPA is maintained as per the information below and provided the student registers for at least 12 credit hours per semester. Scholarships awarded for the spring semester are valid for one semester only. Scholarships do not apply for summer semesters. Applicants must email their scholarship application forms along with all supporting documentation to scholarship@cud.ac.ae. High school students need to have attained an academic average of 99%* or above to apply for a 50% tuition waiver. For current CUD students renewing their scholarship, the semester CGPA at the conclusion of the semester must be 3.98 or higher to continue receiving a 50% tuition waiver. High school students need to have attained an academic average of between 95 – 98.9%* to apply for a 40% tuition waiver. For current CUD students renewing their scholarship, the semester CGPA at the conclusion of the semester must be between 3.95 – 3.97 to continue receiving a 40% tuition waiver. High school students need to have attained an academic average of between 90 – 94.9%* to apply for a 30% tuition waiver. For current CUD students renewing their scholarship, the semester CGPA at the conclusion of the semester must be between 3.9 – 3.94 to continue receiving a 30% tuition waiver. High school students need to have attained an academic average of between 85 – 89.9%* to apply for a 20% tuition waiver. For current CUD students renewing their scholarship, the semester CGPA at the conclusion of the semester must be between 3.85 – 3.89 to continue receiving a 20% tuition waiver. High school students who were granted an automatic 20% tuition waiver for their first semester at CUD and have maintained a 3.8 – 3.84 CGPA, may be eligible for a 10% tuition waiver on the subsequent semester. 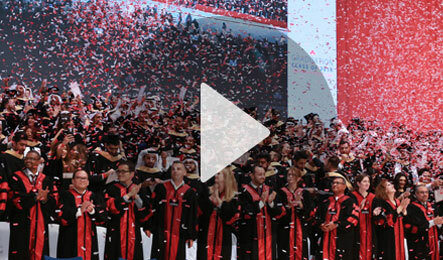 The Guiding Principles for Canadian University Dubai scholarships must be met. This scholarship is meant for elite and talented athletes from any sport who have competed and achieved success at least at a city level. Sports Scholarships are awarded based on the applicant's sports achievement level and their academic performance. A tuition waiver of up to 40% can be applied accordingly. Sports Scholarships are valid for one semester only. Students can reapply each semester to continue their scholarship. Deadlines for the fall semester (July 7th) and spring semester (December 20th) must be met. Sports Scholarships do not apply for summer semesters. For high school applicants to be eligible, they must have a minimum academic achievement of 70%. Returning students are required to achieve a minimum of a 3.0 CGPA to be eligible to apply/ reapply for the Sports Scholarship. Successful applicants will be required to support the sports department in different events and will be required to contribute up to 15 hours per month of community service as part of their commitment to the University. The objective of these scholarships is to promote access to higher education to students facing financial hardship. A tuition waiver of up-to 40% can be applied as evaluated on a case-by-case basis. Financial Hardship Scholarships are valid for one semester only. For high school applicants to be eligible, they must have a minimum academic achievement of 75%. Returning students are required to achieve a minimum of a 2.8 CGPA to be eligible to apply/ reapply for the Financial Hardship Scholarship. Successful applicants will be required to contribute up to 15 hours per month of community service as part of their commitment to the University. All documentation will be kept confidential. Any application with incomplete documentation cannot be considered by the scholarship committee when awarding the Financial Hardship Scholarships. We at Canadian University Dubai pledge to provide an inclusive learning environment and to support the cognitive, emotional and creative development of students with disabilities. Special needs may be justified by physical or other disabilities. Students eligible for a Special Needs Scholarship will benefit from a tuition reduction of up to 40%. For students applying for the Special Needs Scholarship at the point of admission to the University, the academic average will be considered by the scholarship committee on a case-by-case basis. For current students, a minimum CGPA of 2.0 is required to be eligible to apply for the scholarship. Special Needs Scholarships do not apply for summer semesters. Students are required to provide an up-to-date professionally documented diagnosis that will be kept confidentially. The scholarship application is reviewed by and subject to the scholarship committee's discretion. This scholarship is meant for elite and talented individuals from any field who have competed and achieved success at a city level or beyond. Special Talent Scholarships are awarded based on the applicant's achievement level and their academic performance. A tuition waiver of up to 40% can be applied accordingly. Special Talent Scholarships are valid for one semester only. Special Talent Scholarships do not apply for summer semesters. Returning students are required to achieve a minimum of a 3.0 CGPA to be eligible to apply/ reapply for the Special Talent Scholarship.